What is a whoremonger? Strong’s Exhaustive Concordance of the Bible lists the word as a derivitive of pornos, with connotation especially of male prostitutes who sell their bodies for financial gain. 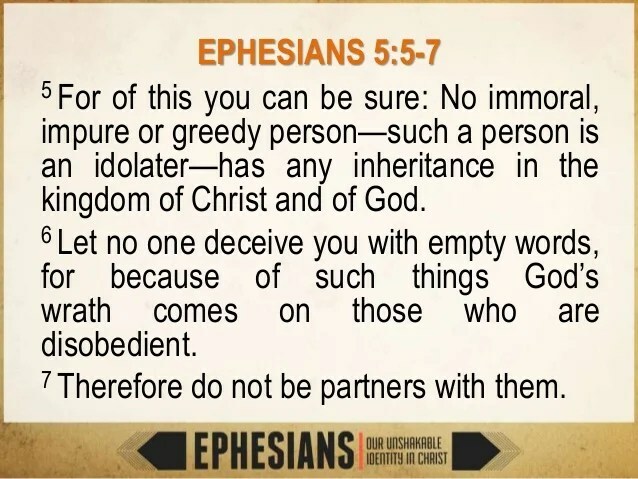 An unclean person is impure and greedy, and people who choose to live in such a way are guilty of idolatry and will have no part in the kingdom of Christ and of God. Their choices condemn them to hell. How many times have we all heard the question, “But how can a loving God condemn anyone to hell?” In all the centuries through which people have voiced that question, the answer has remained exactly the same. It is not God Who condemns us to hell. It is our own choices to disobey God and live in a way that dishonors Him, as well as dishonoring our own bodies, that condemn us. Paul was writing to new believers who had probably been involved to some degree in the sexually immoral worship of Diana. He used strong language here to make them aware of the need for them to turn their backs on the old behaviors. Choices have consequences. When we choose the behavior, we choose the consequence. Such would be Satan’s interpretation of the scripture. Believe me, there’s a lot of laughter in my life without my having to resort to obscenity, profanity, and vulgarity. Nehemiah 8:10 says that the joy of the Lord is our strength. Job 8:21 and Psalm 126:2 both speak of God filling our mouths with laughter. The point here is that there is a lot to laugh about without having to resort to the ribald. One of the myriad of things for which I thank God is the joy, the fun, the laughter in my life. My closest friends share that laughter with me without ever devolving to vulgarity. Yesterday I mentioned that the worship of the goddess Diana was corrupt with sexual sin. It was so much a part of the culture that very few were not affected by it. 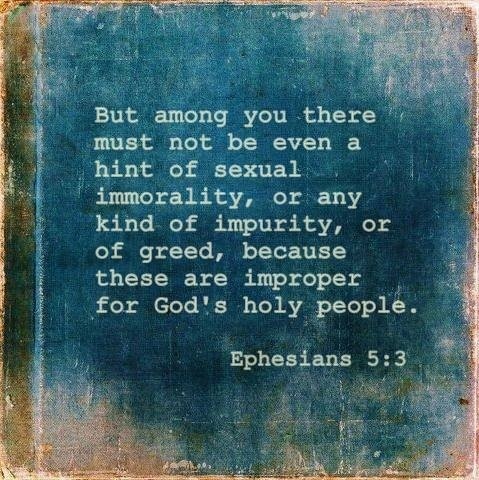 Here, Paul steps up to the plate, so to speak, and tells the Ephesian believers that there must be NO such behavior for them. No kind of impurity or greed should be evident in their lives. I’ve been thinking about the struggle it must have been for some of them. Steeped in a religion that not only encouraged sin, but also demanded it, they must have been amazed at what the apostle was teaching them. It was a complete 180 change for them. Their families who were not believers would have questioned them about their lack of participation in Diana-worship.I’m sure there was mockery and derision, and perhaps threats of disowning them from the family .Maybe there was physical retribution. They may have lost their jobs and become outcasts. This command was far more than just a directive against sexual immorality. I required a complete change in lifestyle that would affect everyone the Ephesian believers were related to and knew in the community. The city of Ephesus certainly did not walk in the love that Jesus exampled. They worshipped the goddess Diana, and there was great sexual sin involved in that worship. Paul admonished the new believers in Ephesus to put away the old habits, to live pure and holy before the people of the city, and to demonstrate the love of Jesus Christ. His obedience to God was a “sweet-smelling savor,” a sacrifice that was fragant to God. 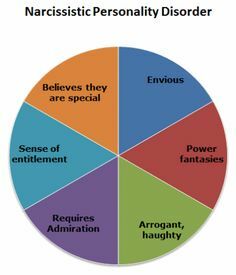 As our nation becomes more secularized and less God-centered, we too are devolving into great immorality. Don’t misunderstand me. There has always been sin. The difference is that it was kept in the dark and not flaunted. Today, sin is presented boldly. Demands are made that it be legalized, and those demands are being obeyed. At the same time, Christianity is coming under stronger attack than ever. Our idol may not be Diana, but it is most certainly worship of all that is fleshly. 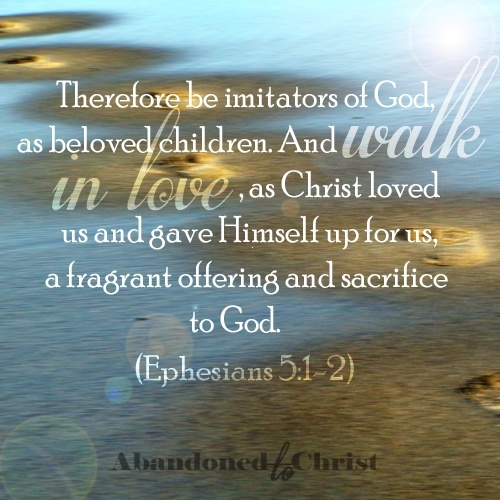 We can be, as Jesus was, a fragrant offering and sacrifice to God if we determine to walk in His love. 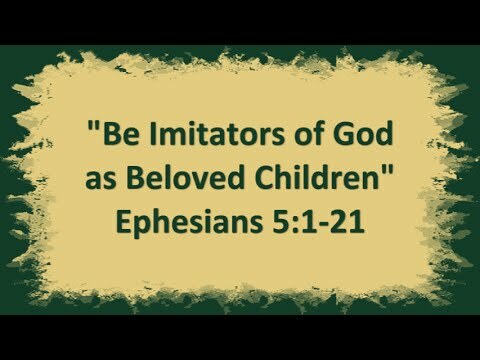 If we take heed to the passage we’ve just finished, we WILL be imitating God. Beloved children often imitate their parents. They do so because they have experienced the sacrificial, unconditional love of their parents. How much more should we imitate the God Who allowed His Son to sacrifice His own life in our behalf. Anyone who grew up in Sunday School and church, as I did, memorized this verse as a child. I wonder, though, how many of us truly understood and practiced it. I was in my early ’30’s before I finally comprehended fully the importance of this verse. Once you get it, it will change your life. All the other ugly things we’ve discussed in this passage are mitigated by the act of forgiveness. Bitterness, clamour, evil-speaking, and malice are worn away by the wonderful erosion of choosing to forgive. Forgiveness is not an event. Only God can forgive and forget. We have a lot of trouble with forgetting, and whenever the memory pops up, we need to choose to forgive yet again. 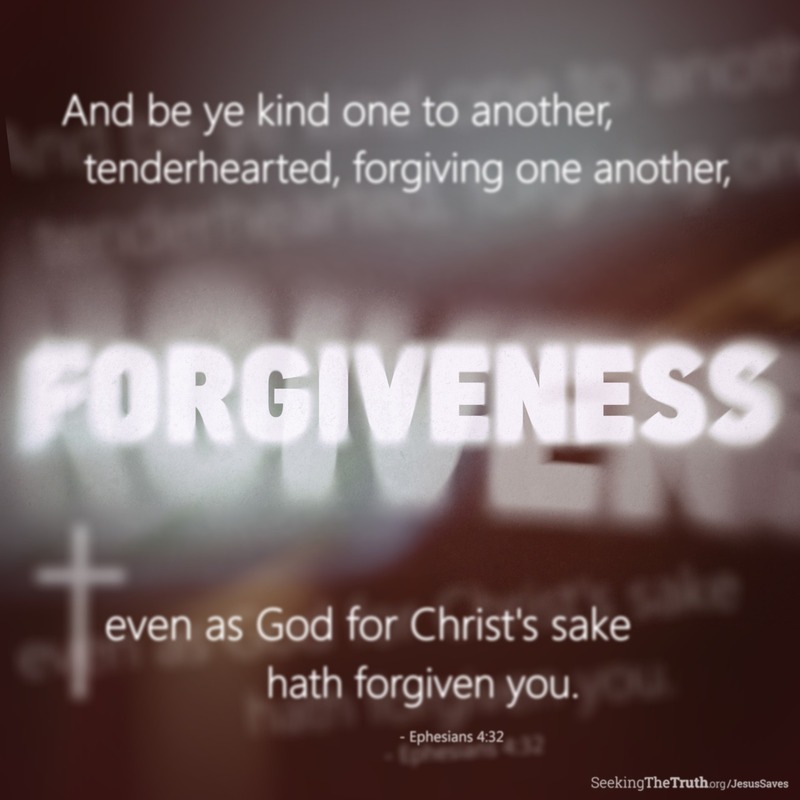 I have written several posts about forgiveness on my Friday Counseling Issues thread. Here is where to go for the first one. You can find them all if you follow the links near the bottom of the post under “related” items.